← It’s a Vegetable…It’s a Side Dish…It’s Pepperonata! 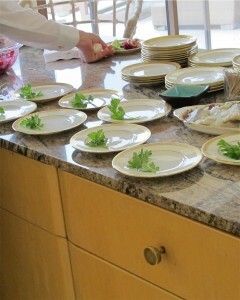 Ah, Passover 2011. One for the history books… This year we had 47 people gathered together to celebrate this special holiday. Friends and family from all over the country converged at a family home in Northern California. Guests ranged from my one year old grandson to a 90-something Bubbie (grandmother). The celebration started at 5pm when guests began to arrive in droves. Everyone enjoyed some pre-dinner nibbles and the chatter soon became so loud it was difficult to hear. The official ceremony started at 7pm with everyone seated at two huge 25-food long tables. Three different relatives conducted the Seder, and in the middle of it all we feasted on salmon, chicken, brisket, various Passover kugels, vegetables, salads…there was enough food for an army. Later in the evening we dove into dessert which consisted of flourless chocolate cakes, macaroons, Mexican flan, sponge cake, and fruits and candies. We didn’t say our final goodbyes until 11 pm. No one left hungry, that is for sure. The holiday retells the story of the ancient Israelites who were freed from slavery in Egypt. As the story goes, the Pharaoh freed the Israelites, and they left so quickly that they could not wait for bread dough to rise (leaven). In commemoration, for the week long duration of Passover no risen bread is eaten, which is why it’s called “The Festival of the Unleavened Bread.” Flat unleavened bread or Matzo is a ubiquitous symbol of this holiday. Depending on how religious a Jewish family is or whether they are Ashkenazic or Sephardic, foods such as grains, cereals and pastas might not be eaten during the week. Interesting to me is that Passover is one of the most celebrated of all Jewish events. Coincidentally – it is one that my own family embraces like no other. It just so happens that Passover is my clan’s favorite Jewish holiday. 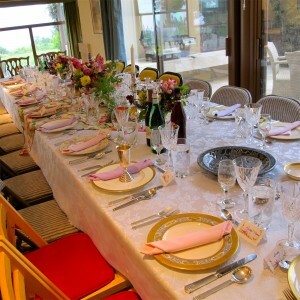 The kids all look forward to the unusual foods, and we all love the Seder, or gathering of family and friends to retell the story of Passover. Most years we give it a more modern twist, and in 2011 much time was devoted during the Seder to discussing different types of enslavement and freedom or lack of freedom in our modern world. With so many families present, there were many wonderful stories and shared practices. This year’s Seder was in part traditional with lots of Hebrew singing, and also modern with guests participating and lots of laughter. At one point Varda, my daughter in law’s mom who was born in Israel, had us all tell about our favorite Passover memories. A huge surprise for all was a tape recording of my daughter-in-law Shira (now 31 years old) singing the four questions in Hebrew taped when she was three years old!! This was truly my favorite part of the evening. Most years I am responsible for a majority of the preparations – setting the table, planning, shopping, and cooking – lots of hard work. But this year – a first. I got to be a guest. And I loved it! Of course, I couldn’t completely relinquish control so I whipped up a couple of matzo-dried fruit kugels (a baked pudding-like dish) and helped out wherever I could. The next morning many of us gathered again at Shira and Daniels and I offered to make fried matzo, a family favorite. It couldn’t be easier and is a very satisfying dish for breakfast. We’ve been known to eat it throughout the year – sometimes even for dinner! Roughly break the matzo sheets into fourths and place into a deep 4-quart bowl. Soak in warm water until they have almost lost their crunch but are NOT too soggy (about 3-5 minutes). Pour into a colander and drain well but don’t push down on the matzo or it might fall apart too much. Meanwhile, heat both butter and oil in a large fry pan on medium high heat until it is sizzling. In a medium bowl – the same one you soaked the matzo and water – whisk together the eggs and milk. Add the drained and soaked matzo to the egg/milk mixture and gently mix together until the matzo is coated with egg. 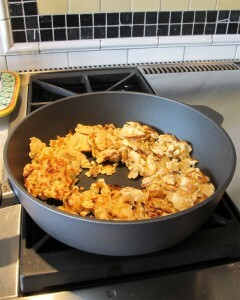 Pour the entire mixture into the oil/butter in the fry pan and lightly press down into a “pancake” to cover the fry pan. Let it brown on one side, breaking it up slightly with a heat resistant spatula. Keep turning and breaking up the pieces until they are browned all over and until all the liquid evaporates. It shouldn’t be dry but should not be too soft either. This process should take approximately 7-10 minutes. I add salt while it is frying to add some extra flavor. You may choose to omit salt at this stage and allow everyone to add their own after it is served. Our family likes this with cherry jam on the side. Some prefer just salt and pepper with no sweet additions. I’ve seen families eat this with applesauce, cinnamon/sugar mix and even with maple syrup. 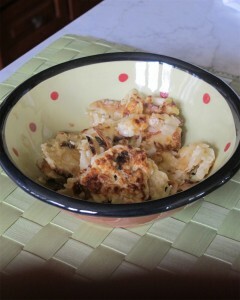 I have made it extra fancy and savory by adding slivered lox and finely chopped onion to the matzo while it is cooking. If you do this, it could turn into a main dish for dinner served with a salad. This entry was posted in Breakfast, North America and tagged Family dinner, Fried Matzo, Matzo Brei, Passover. Bookmark the permalink. I am bringing a box or two of matzoh to Belize. Just sayin’…..
Now that it is passover again I have to try this. I thought Fried Matzah was foolproof, but I made it this morning and it did not live up to my expectations (or my husbands). Kids didn’t even eat it. Soooooo…….I am excited to try this one. A much better recipe from the looks of it. The ratio of eggs to matzo has to be pretty standard. Enjoy! !